Welcome to Your December Issue. What did Adam say to his wife on the day before Christmas? “It’s Christmas, Eve!” How come I’ve reached the age I am and have never heard this one before? 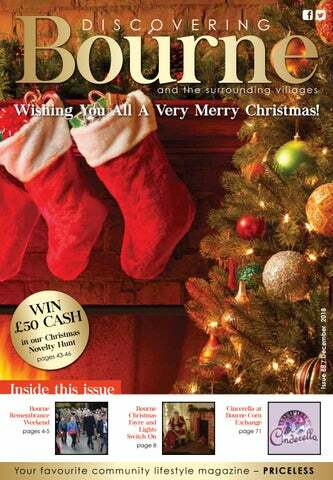 Anyway, another Christmas fast approaching and our team of contributors continue to ensure that your favourite magazine is full of interesting features, advice and information to make your lead-up to the big day as enjoyable as possible. Thanks to them all and, on behalf of us all on the magazine, let me wish you the very best for a merry and peaceful Christmas, with a healthy and successful 2019 to follow. Don’t forget … Bourne’s Christmas Fayre on December 1st and the big lights “switch-on”, and why not have a go at our Novelty Hunt competition? Just think how £50 would surely help make it a “Happy New Year”! “What’s December’s issue looking like?” I hear you ask. As usual, wide-ranging and varied, with some serious events to read about this month, none more so than the centenary of the ending of The First World War and the ways in which Bourne came out in force to remember, and pay their respects. Our usual advice providers, (covering aspects of health, the law, finance, holidays and protection against rogue traders), continue to inform wisely, whilst we report on how the Hereward Medical Practice has now become a “Super Practice”! With the small matter of Christmas only a few weeks away, the quiz takes on a festive look, whilst old chestnuts (sorry!) come out for their annual airing: What do you get if you eat Christmas decorations? Tinselitis. What do you call a lobster who won’t share any of his presents? Shellfish. Marks & Spencer say it wouldn’t be Christmas without M&S. They’re right – it’d be “Chrita”. I wish you all a very happy and peaceful Christmas, with good health and success on the way in 2019. Enjoy the read! 4/5........... Remembrance Weekend in Bourne. 6/7........... Matt Powell – Bespoke Jewellery. 14.............. A stress-free Christmas from Renu. 19.............. Liza at Indulge – Holistic Massage. 74............. The Christmas Puzzle Page. 76............. Pets and Vets – Post-Brexit? 81/86...... Classified businesses directory. 1914-1918 conflict came to be known). Offering a blaze of colour on an occasion that can be quite sombre, the general public took the project to their hearts and viewed the exhibition, stunned by its brilliance. The Town Hall, lit by night in glorious poppy-red, was astounding and amazed passersby in the dark of the night. The thanks of the whole town should go to all of those organisations involved, for having contributed to such a fantastic weekend that will be talked about for years to come, but our biggest thank you should be made to John Wand and his fantastic team at Roadphone NRB, who worked tirelessly to make everything happen behind the scenes … at no cost to the town! We should all be proud to live in our glorious town”. (Thanks for these words go to Bourne’s Clerk to the Town Council, Ian Sismey). Clients now contact him for that unique piece of jewellery – “Same person … different guise,” Matt explains. “Bourne and district clients are still more than welcome to get in touch,” he insists. Wedding rings continue to be one of Matt’s best-sellers and he is particularly enthusiastic about his new machinery which enables him to offer individualised, Damascus steel rings for discerning gentlemen. As Matt no longer offers the repairing service from his Crown Jeweller’s days, he can focus his efforts and talents entirely on high-quality, bespoke pieces of jewellery instead. Fine Jewellery, Sparkling Future! When Matt Powell’s family’s jewellery business closed in Bourne recently, it perhaps gave the impression that Matt’s role in the Crown Jewellers success story had come to an end too. “Nothing,” Matt assures me, “is further from the truth!” Having worked for many years in the family business and building a formidable reputation on a national stage with his magnificent, award-winning bespoke pieces, Matt now operates from his Peterborough workshop as a private jeweller. As if his C.V. wasn’t already impressive enough, Matt modestly lets slip that he has recently been accepted as a “Freeman of the Gold and Silver Wyre Drawers Guild” in London. The future shines as brightly for Matt as do his bespoke pieces of jewellery! Our shop is open 9am - 5p m each day ! hristmas HappyNC and ew year! mental health, then try to keep it to a minimum! Those gifts! - Pressure to show everyone how much you love them by the value of, or time spent shopping for, the gifts you give is not only futile, but leads to increased pressure and stress. Consider purchasing gift vouchers or invites to spend time with your loved ones in the New Year instead. This gives everyone something to look forward to and means you can stay within your budget. own personal wellbeing, whether it be going to the gym, attending a class, having your hair or nails done or meeting a friend. These are usually the first things to go when you are under pressure. Don’t be afraid to ask for help Try sharing responsibility between family members rather than taking on everything yourself. If everyone has a job they are responsible for, no one family member will carry the whole burden. Children can help making name places or laying the table, everyone can peel some vegetables, or help serving drinks. This gets everyone involved and makes it FUN! Conversely, not everyone has an abundance of friends and family around them over Christmas. It is perfectly reasonable to accept that this may be a difficult time of year. If you don’t enjoy all the traditions of Christmas, make a plan to do something that day that you do really enjoy. If you would like to be socialising over Christmas, then don’t be afraid to accept invitations if you are asked. Have a look at local events that are going on, such as the Salvation Army or soup kitchens, where you can either attend yourself or volunteer to help. I would like to wish you all a very merry, stress-free Christmas! 60 minutes of pure bliss. A 30 minute back neck and shoulder massage to relieve tired, tight muscles and a 30 minute face and scalp massage to soothe your tensions away. A Madagascan Red Island Ritual including a full body exfoliation and relaxing full body massage, a deeply nourishing Decleor Vitamin Surge Facial and ﬁnish with a ﬁle and polish for your ﬁngers or toes. A relaxing back massage, followed by a Decleor Glow Boost Facial and mini manicure with a ﬁle and polish. Pure relaxation! A full body Hot Stone Massage to ease your tension away and a Decleor Aroma Expert Facial for a radiant, luminous complexion then your choice of any two of the following treatments: Heated Hand Treatment • Heated Foot Treatment Express Ear Candling • Eyelash Tint File and Polish for your ﬁngers or toes. RESTORE - Treatment time 120 minutes | £72.50 Renu’s Ultimate Foot Ritual, an Ultimate Manicure and a Decleor Express Facial all wrapped up into a complete spa experience for a beautifying treat. For the full works, add on a wash and style in our beautiful hair salon or a Touch of Colour with mineral makeup for an additional £16.00. Shared treatment rooms are available by request. * Please note all treatment packages must be taken as one appointment. For Him... EXECUTIVE COMBO (60 minutes) | £43.00 A deeply relaxing Back, Neck and Shoulder Massage to soothe away muscular tension and stiﬀness, followed by a Gentleman’s Facial and a tension release scalp massage. RESCUE AND RECOVERY PACKAGE (90 minutes) | £53.00 Feeling the pressure? Whether you’ve been overdoing it at work or the gym, this targeted treatment focuses on rescue and recovery. Tension in the back and shoulders is eased away through the power of a Hot Stone Back, Neck and Shoulder Massage, followed by an Energising Face Treatment and Tension Release Scalp Massage. Finish the job with either a Gentleman’s Hand or Foot Treatment or an Ear Candling Treatment to leave you invigorated and ready to go. Shared treatment rooms are available by request. * Please note all treatment packages must be taken as one appointment. Gain control of your addiction and leave it behind, where it belongs Until recently, very little was known about how the brain can turn off the desire for addictions and how the subconscious mind can stop addictive urges. It is time to look at the science of how the brain works, how the subconscious mind controls our life, and how to change it for good. and clinically accepted approaches, the mind and behaviour modification techniques work to retrain and recondition at the core, unconscious level. The brain is actually a supple, malleable organ, as ready to unlearn as it is to learn, capable of transforming, resetting and repairing its internal communications. Turn off your desires We already know that the brain is constantly changing. The neuroplasticity of the brain allows focused treatment to create new neural connections. Without treatment, the brain uses neural pathways to trigger emotions, needs, pleasure and cravings, which feed the addiction. Treatment changes those responses by rewiring of the neural pathways and the subconscious mind, thereby bringing an entirely different reaction. Deal with stress in a different way Some people use an addiction to forget a problem, to mask pain, dampen down emotions or to reduce stress and anxiety. They may have noticed that, as soon as they have decided to make changes, the urge to continue the addiction just seems to get worse. This is the subconscious mind controlling your habit and the effect of the neuro-chemical, dopamine, on the brain. Solution focused hypnotherapy reduces stress and anxiety, and looks at the emotions or triggers that fuel the addiction, allowing you greater control over the addiction. Today, hypnotherapy for addiction is a growing trend. With hypnosis, we aim to get to the root of the problem through hypnotic trance. In this state, your mind is more receptive to suggestions and ideas in tune with your ultimate goals, changing ingrained behavioural patterns and rebuilding your emotional health. Don’t wait. Act now If you’re struggling with an addiction, contact Christine who will be pleased to help. How often have you thought, “I could have done that better myself”, when having had a treatment or a meal that was distinctly average? How many people then actually do anything about it? Well, Morton mother of three, Liza Gunn, has … and, for the past six months, she has been offering holistic massage, either from her home or by visiting her clients, having already embarked on the necessary training courses. Feedback has been overwhelmingly positive, prompting her to take the ambitious next step, which saw her establish “Liza at Indulge”, a business offering holistic massage and beauty treatments in a private room in Wake House on North Street in Bourne. Holistic massage, Liza is keen to point out, is much more than just a beauty treatment. The enormous health benefits which massage can bring are well documented, and are key to Liza’s whole approach. She offers an ‘Indian Head Massage’, which is a technique of manipulating soft tissues in the upper back, shoulders, upper arms, neck, face and scalp. A 30-minute massage costs £20, with a further £5 added for a 45-minute treatment. Liza’s ‘Traditional Thai Foot Massage’ involves thumbs, hands and a wooden acupressure tool, in a massage applied to the lower legs and feet, using rubbing, kneading, stretching and vibration techniques. The charge for this 45-minute treatment is £35. Besides these two treatments, Liza also offers her ‘Classic Beauty Facial’ and ‘Individual Eyelash Extensions’, both of which can be combined with the massage options, to create particularly attractive ‘Treatment Packages’, extremely kind on both your skin and on your purse! Indian Head Massage, Traditional Thai Foot Massage, Beauty Facials and Individual Eyelash Extensions. * Not to be used in conjunction with any other offer. Offer ends 31st December 2018. Extended GP Access As part of our commitment to provide a greater range of services, we have already commenced our Primary Care Extended Access service on October 1st 2018. This service means that our practice is now open until 8pm, Monday to Friday, and is open not just to our own patients but also to those registered elsewhere locally. It is especially aimed at those struggling to get an appointment to see a healthcare professional, irrespective of where they are registered. The service has been commissioned by NHS South Lincolnshire Clinical Commissioning Group, and is being provided by our practice in conjunction with Allied Health South Lincolnshire, (our GP federation). From April 1st, 2019, we anticipate that our service will expand to also include Saturdays and Sundays, thus giving seven-days-a-week access. We hope this is seen as another positive commitment to our local community. Appointments here at the Galletly Practice are available, Monday through to Friday from 6.30pm to 8 pm. Appointments are pre-bookable in the usual way. If you are not registered with our practice but live within the community, we are still happy to see you. Ask your GP Practice reception for an appointment within our service. You will be asked to consent to our viewing your medical record so that we can provide the best possible care, as such we can only see you if this consent is given. Once given and on attending your appointment, our healthcare professionals will be able to view your personal GP record. Any updates following your consultation will be automatically received by your practice at the end of the consultation. To arrange an appointment, or for more information on when and where appointments are available, please speak to your usual practice. This service also links to our same-day appointment system for all our registered patients. Simply call us on the day you require assistance and your needs will be addressed that day by our GPs, you will never be advised that we have no remaining appointments or suggest you should call back another day. If you are not registered with us, and this system would better suit your needs rather than waiting long periods to see your GP, our lists are open and we would be happy to register you as one of our patients. Currently, on Saturdays, Sundays and Bank Holidays, appointments are available from 9am to 12 noon within our local area, via The Munro Practice in Spalding. The Galletly Practice is providing this service in conjunction with other practices across the area who are aware of our service and should offer you appointments if appropriate and available. We are working closely together so that you can take advantage of high-quality care within your immediate locality, negating the need to travel outside of Bourne or the immediate area. We wish all our patients a very Happy Christmas and a Happy New Year and trust the festive season will be a joyous one. There will be no need to order outside of routine ordering. Please remember to order any medications or repeat prescriptions early. We ask our patients not to order their repeat medications if they do not fall due over the Christmas period as this will help to ease, what is already a very high demand period. If you will be away over the festive season and need to adjust your normal ordering please do so in plenty of time. Please remember that 2 clear working days are required from the point of order to collection of medications/ repeat prescriptions. Looking after your feet is essential for general health and wellbeing. As a mobile foot practitioner I visit you at home to carry out an initial assessment and provide the necessary treatment. All sessions conclude with a foot massage. To the people of Bourne and surrounding communities. On behalf of Bourne Foodbank I would like to thank you all for your amazing generosity at this ‘Harvest Festival’ time of year. Your gifts have now been weighed in, sorted and stored ready to help those people in our community who find themselves needing help and support from the Food bank. We always ensure that our clients receive a friendly welcome and tell them that the food they receive has all been donated by local people. Without exception, they are always extremely grateful. A child from Headstart Nursery and Pre-School has secured a place in the finals of the www. minimecardco.com national Christmas 2018 Art Competition, to win their own star! After our last visit to see Bourne Players we were expecting to be suitably entertained and we were not disappointed. We went on the first night, always a difficult one for the cast, and after a start that was a little shaky, the actors settled into their roles and began to gain confidence as the audience responded to the humorous situation that was revealed. after the overall winners, and information about the sky at night which will be really interesting for our children, so we are keeping our fingers crossed.” The artworks will be judged by a professional artist to decide the overall winners from across the UK. The second half was acted with far more confidence and Ian Gibbs had us all laughing at the absurd situations he was forced to make up. Once more, a thoroughly enjoyable evening and our congratulations go to the cast, Director Maureen Berkes, and all of those behind the scenes. We look forward to their next production. This year, from our local schools in Bourne and surrounding villages, local churches, organisations and communities, as well as individuals - we have received in excess of 933 kgs of food! A huge thank you to all who have donated. You have helped to ease some of the worries of local families in need. Thank you for your continuing support. Ladies Night Raffle Boosts Carers Sitter Service Funds A cheque for £670 was presented to the Carers Sitter Service recently, having been raised from a raffle at ‘Ladies Night’, held by The Hundred of Elloe Masonic Lodge. Heather Allen explains, “The Carers Sitter Service provide volunteers to give a break to carers to allow them ‘time out’ to do the things that, as committed carers, they struggle to find the time to do. For me, the Service provides a sitter to take my mother, Alethea Barnsdale, to and from the Darby and Joan Club on a Monday, freeing me up to spend an afternoon with my sister. We are so grateful to the Carers Sitter Service, and that is why I chose them to be the beneficiaries of the raffle.” Marjorie Boxall-Hunt, (Co-ordinator at the Carers Sitter Service), accepted the cheque for £670, on behalf of the Service. The Carers Sitter Service is based in Bourne. If you would like to use the Service, or would like to get more information about becoming a volunteer, you can contact Marjorie Boxall-Hunt on 01778 420257, or e-mail carersitterservice@gmail.co.uk. From left to right, Roy Mead, Marjorie Boxall-Hunt, Angela Mead, Heather Allen and, centre front, Alethea Barnsdale. Halloween tshirt design competition WINNER REVEALED Design your own hand drawn Halloween tshirt winner was Bradley. What a fantastic design, well done! What does luxury cruising mean to you? Do you want the most exquisite accommodation, the most attentive service or a gastronomic experience you will never forget, along with unlimited shore excursions? If this is what you’re looking for, we have the perfect cruise to match with our luxury cruise partner, Regent Seven Seas. Regent Seven Seas Cruises® offer the MOST inclusive luxury experience, where everything - from flights and transfers, unlimited shore excursions, all fine dining, beverages and service charges, even wi-fi access - is included. This is cruising as you want it to be, a sumptuous world where your every wish, every whim and every want is met with personalised service, luxurious comfort and complete fulfilment of your passion for travel – without compromise. Clare Lockett Travel Counsellors are wholeheartedly committed in providing exceptional customer service. Constantly striving to provide the ultimate travel planning experience tailored to the individual client. We work hard to exceed expectations and pay special attention to detail, ensuring our customers have the most wonderful experience from start to finish. Offering excellent expert knowledge, value for cost and the utmost professional courtesy. Pinnacles of elegance and grace, the intimate ships of their fleet offer the feel of a modern, boutique hotel with the choice of small resort. With all-suite accommodation, some of the largest private balconies at sea and an enviable staff-to-guest ratio, you are warmly greeted by a familiar face each day. With an incomparable level of personal service and selection of spectacular gourmet restaurants, there’s no better way to experience luxury travel. To find out more and experience the extraordinary with Regent Seven Seas Cruises®, we are hosting an invite-only event, on January 16th, 2019 at The Haycock Hotel, Wansford, near Peterborough. Please contact the office to reserve your place at this exclusive event. A great value meal with a 2 or 3 course option. Perfect for that afternoon get together with family and friends. Please book early to ensure your table. Join us for a fantastic selection of Traditional Christmas Fayre. The ideal way to celebrate Christmas with your loved ones, family and friends. Come and enjoy New Year’s Eve with us! New Year’s Eve 1920’s Party Champagne canape reception, 7 course dinner, Table magician, Resident D.J. Christmas Party Nights Three course dinner and live music till late. Available on Saturday December 8th, 15th & 22nd. Wishing all our customers Merry Christmas and a Happy New Year Bookings are currently being taken for Christmas Afternoon Teas and Christmas Lunch – make your booking now to avoid disappointment! •	Group	bookings	are	accepted. •	Menus	are	on	our	Facebook	page. •	To	secure	your	table	a	deposit	of	£5	per	person	is	required. in participating shop windows and win Â£50 IN CASH! Please return your Christmas Novelty Hunt forms to: Newton Fallowell Estate Agents, 2 North St, Bourne PE10 9EA. The competition closes on December 31st 2018. Good Luck! New for 2018, the Cut & Collect Out-Front Rider from Husqvarna, collects Leaves as well as it does Grass! want to make them. This could arise from a temporary situation, such as hospitalisation, or a more permanent one, such as being told that we are suffering from a long-term health issue. We can consider making a Lasting Power of Attorney for either ‘Financial’ decisions and/or ‘Health and Care’ decisions. If we lose capacity, or have similar problems, a more complicated procedure is called for, which requires more work to be put into place. The court fees payable are higher, and we have to wait longer to be able to have decisions made to protect us. Being in control of these matters can be vital to protect our interests in older age. It also protects our loved ones. Thinking of moving home? Take a look at a new Larkfleet home. ONLY A 5% DEPOSIT REQUIRED WITH HELP TO BUY Available for first-time buyers and existing homeowners. How Would a Hard Brexit Affect Bourne’s House Prices? After the weather and football, the British obsession with the UK property market is without comparison to any other country in the world, whilst the number of transactions is an important bellwether of the state of the property market. Brexit, No Brexit, Hard Brexit … in the whole scheme of things, it will be another footnote to history in a decade’s time. We have survived the ‘Oil Crisis’, 20%+ hyperinflation in the 1970s, mass unemployment in the 1980s, interest rates of 15% in 1990s, the ‘Global Financial Crash’ in 2009 ... whatever happens, happens. Now, it’s true the Bourne property market is seeing less people sell and move, and the property values are rising at a slower rate in 2018 compared to the heady days of the first half of this decade, (2010 to 2015), but before we all start panicking, let’s ask ourselves, what exactly has happened in the last couple of years since the Brexit vote? People still need houses and a roof over their head. If property values drop, it is only a paper drop in value ... because you lose when you actually sell. Long term, we aren’t building enough homes, and as property is “a long game”, no matter what happens - the property market will always come good. agents and a great time to put your property on the market and get moved, with the “New year, new me mentality”. But be aware that many other homeowners have that very same idea and lots of competition could see you not get the attention you deserve. So, our advice would be to get ahead of the market, contact us today and get sold BEFORE the competition. We will be the agent to make your Christmas and New Year special, with our exceptional customer service and high-quality marketing materials putting you ahead of the pack. Everyone at Newton Fallowell would like to wish you all a very Merry Christmas and a Happy New Year. with my partner. I was looking initially for advice on what would happen to the monies I had accrued in the event of my death, and what could be done to ‘ring fence’ those monies. for those monies now in an investment fund; however, everything to date has gone very smoothly, and I have no reason to believe that they will not continue to do so. How did your adviser help you? He explained thoroughly what my dependants would and, more importantly, would not receive from my pensions. Taking those facts into consideration, I made the decision to move those monies into an investment fund and, in doing so, take the tax-free lump sum that was available; this only after much consultation with my adviser as he explained the pros and cons of coming out of the final salary pensions. What could they have done better? In all honesty I do not believe I could have received any better help and advice than that offered to me by the adviser; extremely thorough and clear. Rating Advice: 5 star Service: 5 star Value: 5 star We were delighted to receive this positive feedback as to us it proves we are delivering a level of service our clients can rely on. If you would like to arrange a FREE initial consultation with one of our team of experienced Financial Planners, then please contact the office on 01778 342291 to arrange an appointment. Peace of mind for you and your family Clare Megson has established a new business in Bourne to give local residents the opportunity of accessing the support of a will writer and a later life planning advisor. Clare previously practised as a solicitor before leaving private practice to set up Megson, a niche firm, specialising in will writing, powers of attorney, Court of Protection, trusts and probate advice. Will writing and later life planning are areas that can be riddled with companies offering poor advice, and practitioners who have little knowledge or experience. Therefore, it is important to ensure that you are getting advice from someone who is experienced and qualified. Clare will visit you in your home at a time convenient to you, offering friendly guidance and advice in plain English, with set quoted fees. Stay Merry, not Miserable in the Run-Up to Christmas ‘TIS the season to be jolly – but as we prepare for the season of goodwill, not everyone shares the Christmas spirit. With many of us starting the Christmas shopping earlier, there is a fair chance that many of our shop purchases and online orders are beginning to pile up. So, with gifts galore adding to the decorations, tree, food and drink, December is a time when many of us let our guard down, amongst the excitement leading up to the big day. For opportunist thieves, visible presents under the tree, open car boots full of shopping while loads are being taken into the house, and even the possibility of an unlocked garage are rich pickings which can turn your Christmas from being ‘Merry’ into ‘Miserable’! Equally, flaws in home security while out and about visiting friends and family are a beacon to thieves – so always remember to check your alarm and never leave doors, windows or garages unlocked. Some tips for a safe and happy festive season: • Don’t leave presents in full view – either in the home or on the back seat of the car. • Shorter days mean a longer time for thieves to be in operation – always lock your car and front door when entering your home. • Keep a light on indoors and outdoors if you are out visiting friends or family. • It may be an idea to fit some motion detector security lighting – it won’t just be carol singers who come calling. • Keep your personal data safe – and securely dispose of receipts. • If you are expecting parcels or deliveries whilst you are away from home, try and arrange for them to be delivered to an alternative address instead of them being hidden by the bins! • If buying bikes and / or electronic equipment for Christmas – mark them with your postcode • If using outdoor festive lighting, ensure cables aren’t passed through windows, leaving enough of a gap for burglars to make use of. • Away over Christmas? – plan ahead. If you’re going away at Christmas, be sure to cancel any newspaper or milk subscriptions. Arrange for a neighbour to park on the driveway to help create the impression someone is home. Do not to leave descriptive telephone answering machine messages like “we’re away skiing for the Christmas holidays”, or post your plans on social media. For any home security improvements, we have locksmiths, alarm and CCTV installers, electricians and many other traders who can help. Visit www.safelocaltrades.com or call free on 0800 014 1832.
incompatible. Sadly, Microsoft are not very supportive for this latter issue, and if no new drivers are available for older hardware, they tell you to update your hardware or roll your Operating System back to Windows 8. Very annoying, given it was Microsoft that were pushing everyone to Windows 10 in the first instance. This is exacerbated in that Windows 10 updates are now mandatory - a good move from a user data security point of view, but unforgiving for those that find their older systems unable to run the updated versions. Going back to the forthcoming v1809 update, I would advise that everyone running Windows 10 ensure they have a current data backup and also to take a Windows restore point now, prior to the update installing. Agent of The National Farmers Union Mutual Insurance Society Limited. Raffle and Refreshments available at the interval! Together in Bourne and District will be presenting a Living Crib Nativity Scene from 12noon to 4.00pm in the arches in front of the Town Hall. Something not to be missed! at Bourne Methodist Church.Tables will be set up and materials will be provided for children of all ages. Drinks and light refreshments will be provided free of charge. Please come and enjoy yourselves, everybody welcome. 1st - The Salvation Army Community Band will be playing carols at Bourne’s Christmas Fayre and Lights switch-on. They will also be having a stall displaying the work of The Salvation Army in Bourne. Church Morton. £7 on day, gift included. Please book via Kaygmcmanus@gmail.com. 1st - Christmas Fayre from 10am to 12noon in Bourne Abbey Church Hall. Many stalls and refreshments. 8th - New Day Baptist Church, Morton, Messy Church 11am to 1pm. Crafts, story, buffet lunch.....for all the family. of Christmas wreaths, at St John the Baptist Church, Church Street. The theme for this year is “Christmas carols” and local residents, organisations and businesses are providing the trees and wreaths. The church will be open on Saturday from 10am -3-30pm and on Sunday from approx 11am -3-30pm and it will conclude with informal carol singing on the Sunday at 3pm. Light lunches, cakes and beverages will be on sale and there will also be activities for children. There is no admission fee but donations will be gratefully received. For further details contact Maryon Avery at bastonctf@gmail.com or phone 07471198497. Christmas Fayre at Manor Lane, Bourne. Open from 10-30am –12-30pm. 12th - Prize Bingo at Aslackby Village Hall Doors open at 6.30 pm eyes down 7.00pm. 12th - Bourne Abbey Church “Nibble and Natter” in Abbey Church Hall :10am to 12noon. 3rd - Windmill Writers creative writing meeting 7pm in the Windmill room at Wake House. £3 per writer, to cover costs. chill out and relax at Bourne Baptist Church Hall, West Street at their Chill ’n’ Chat free drop-in sessions, from 10am-12noon. If you need support, help or advice volunteers are on hand to assist. All welcome-young or old. NorthStreet, Bourne with Cheryl Perkins: 7.30pm start. Entrance £5. Raffle extra. Please note there will not be a January meeting: Next meeting 7th February. Same time and same venue. Everyone welcome. is the most established of all the UK Christmas Markets that are held today. With numerous stalls bringing traditional German fayre, mulled wine, roasted chestnuts and much more it promises to be as big and as popular as ever. For more information, visit www.lincoln-christmasmarket.co.uk. from 3pm to 6pm. Craft stalls, biscuit decorating, Santa’s grotto, children’s craft making table and refreshments. Exchange and will be hosting a presentation by David Richards CBE, Chairman of Prodrive and also Chairman of the Motor Sports Association. Today, Prodrive runs Aston Martin Racing in the FIA World Endurance Championship and also has a growing reputation for the development of advanced engineering solutions. David will be talking about how Prodrive has developed over the last 35 years, followed by an insight into the role of the Motor Sports Association and their vision for the future.Doors at the Corn Exchange open at 7.00 pm and David will begin his presentation at 8.00 pm. open to all Film Club members, doors open at 7pm: bar. Membership is free to all: to join please e-mail filmclub@ elseapark.co.uk. Methodist Church starting at 3.00pm: light refreshments served after the service. Everybody is very welcome to join them for this festive occasion. leading a Carol Service at Morton and Hanthorpe Village Hall:7.00pm. 23rd - Quiz Night at the Masons Arms: £1 entry. The jackpot is standing at £310, if it’s not already been won! 8pm. 23rd - Decorate the Christmas tree family service at Dyke Baptist Church 3pm. Doors open 7.30pm, Bourne Corn Exchange, Abbey Road, Bourne, PE10 9EF. Live band JFK plus disco, hot food included in ticket price, licensed bar, tickets £20 each available by calling 07517 935194 or at Hill & Clark, 15B North Street, Bourne. Families welcome. 1st - Live Country Music evening at Masonic Centre Hall, 1-2 Roman Bank, Bourne, Lincs PE10 9LQ. First class Country singers from around the UK, this month Rob Childs: whether you’re a line dancer or a listener, these evenings are for everyone who appreciates good Country music. Entrance £9. No bar, so bring your own drinks. For further information, phone Donna 01778 421932 or 07718972329. 1st - A return visit to the British Legion by Leigh Hitch: a good night was had by all on his last visit, so expect a cracking evening. Start time 9 pm but open from 7pm, early arrival is advised. Phone 01778 421775 for more details if needed: Members £1 entrance. Non-members welcome £2. 1st - Harmonica workshop with Steve Lockwood at Stamford Arts Centre. Harmonica master Steve continues to write and deliver all new workshops especially for Stamford Arts Centre! Whether you’re a complete beginner or more advanced, play pop, rock, blues rhythms, cool country wails, pitch-bend all the way down and jam along with rockin’ solos. Diatonic harmonicas in C available on the day for £8 - 1.30pm to 5pm - Stamford Arts Centre, St Mary’s St, Stamford, PE9 2DL £30 - 01780 763203. 14th - Popular local band, Revolver, playing rock and Indie anthems at the Masons Arms, Bourne: 9pm. who brings a good atmosphere to the club, will be singing songs from the ‘60s onwards at the Royal British Legion. Start time 9 pm but open from 7pm, early arrival is advised. Phone 01778 421775 for more details if needed: Members £1 entrance. Non-members welcome £2. 15th - Brothers Grimm return to the Masons Arms, Bourne tonight at 9pm. 2nd - Open Mic 8pm at the Hare and Hounds, West Road, Haconby, Bourne, PA and soundman provided. For further information, phone 01778 571428. 21st - Rock, Pop and boogie with Cuttin Loose at the Masons Arms, Bourne tonight at 9pm. at The Masons Arms, Bourne, 9pm. covers from pop to rock to swing, ‘50s to the present day. by Neil Timothy, who was a huge success, he has been asked back for Christmas Eve. Start time 9 pm but open from 7pm, early arrival is advised. Phone 01778 421775 for more details if needed: Members £3 entrance. Non-members welcome £5. 24th - New to the Masons Arms, Bourne, Nick Jarman singing songs from the ‘60s to the ‘80s. 9pm start. 29th - If you enjoy Irish Country and ’60s music then go along to the Masons, Bourne at 9pm and listen to Dean & Co.
31st - See the New Year in at the Masons Arms, Bourne with the ever-popular Mark Bishop: 9pm start. 2. Please be aware of traffic when visiting Santa and approach the sleigh from the kerb side only; your family’s safety is our priority. 3. Santa will endeavour to cover all areas of Bourne but cannot visit all roads. 1. Please visit our website www. bournelions.org/2018-diary/ for a list of streets that Santa will be visiting on any given evening. 4. Santa can only visit between 6pm and 9pm each evening. It is therefore physically impossible for him to stop outside all houses, as he has a large area to cover and very limited time to achieve this each night. Your consideration to this is immensely appreciated. Thank You. Which nickname for Hollywood sounds ‘Christmassy’? 15) Which word, associated with Christmas, comes from a Greek word meaning, ‘We can act anything’? 16) Who is Aladdin’s mother? Who popularised the Christmas tree in England in the 19th century? 17) Which two names of Santa’s reindeer mean ‘Thunder’ and ‘Lightning’? 18) Who made the headlines in 1906 by refusing Christmas dinner? Which carol contains the words, ‘Be near me Lord Jesus; I ask thee to stay / Close by me forever 19) Popular Christmas houseplant, named after J.R. and love me I pray’? Poinsett, US Minister to Mexico. Why was Boxing Day so named? What kind of 'bread' is traditional at German Christmas markets? Which mind-boggling and very frustrating device, named after its inventor, was one of the best-selling Christmas gifts of 1980? 10) Which biblical town's name means 'house of bread' in Hebrew? 11) What is the English equivalent of a Norwegian 'Julekaka'? 12) Where, in literature, was it always winter but never Christmas? 20) What bird did Queen Elizabeth I decree should be eaten at Christmas? 21) Which charity ceased in 1989 after five years, in which time it had raised £90 million? 22) What did Harry Potter get as a Christmas present during his first term at Hogwarts? 23) The words ‘God and sinners reconciled’ are from which Christmas carol? 24) In which year did Barbie first appear under the Christmas tree – 1949, 1959, 1969 or 1979? 25) Which former Hollywood child star once said, "I stopped believing in Santa Claus when I was six. Mother took me to see him in a department store and he asked me for my autograph." 13) What is the birthstone colour of someone born on Christmas Day? ANSWERS 1) Cranberry, 2) Tinseltown, 3) Indian Ocean, 4) Prince Albert, 5) After the custom of giving ‘Christmas boxes’/tips to workmen/tradesmen, 6) Away in a Manger, 7) One of the berries (for good luck), 8) Gingerbread (Lebkuchen), 9) Rubik’s cube, 10) Bethlehem, 11) Christmas cake, 12) Narnia, 13) Turquoise, 14) He was the first department store Santa, 15) Pantomime, 16) Widow Twankey, 17) ‘Donner’ and ‘Blitzen’, 18) The jailed ‘Suffragettes’, 19) Poinsettia, 20) Goose, 21) Band Aid, 22) Invisibility cloak, 23) Hark the Herald Angels Sing, 24) 1959, 25) Shirley Temple. Spoil your loved one this year! Great Christmas gifts for your pets! change in the current legislation surrounding pet passports. Your pet dog, cat or ferret will need to be micro-chipped before it can be given a rabies vaccine and issued with a pet passport. It will be twentyone days before you can travel across Europe. On returning to Britain, dogs will need a tapeworm treatment, twenty-four to onehundred-and-twenty hours upon entering the U.K. A second possible outcome is that the above regulations will apply but, within ten days of travel, an official veterinarian will need to issue a health certificate in addition to the pet passport. A health certificate will be required every time you wish to travel to Europe with your pet and, on arrival in the E.U, you will need to report to a Travellers’ Point of Entry. The most complicated possible outcome will be to return almost to the pre-passport days. In this case, a rabies injection is given after microchipping, but a blood test is required thirty days later to ensure that the rabies vaccination has taken full effect. There will be a three month wait before travel is allowed, so a minimum of four months of planning is required. If the blood test comes back showing the vaccine has not had the required effect, the whole process will need to be repeated. An official veterinarian would again need to issue a health certificate for every journey abroad, when all the requirements have been met. The decision on a Brexit deal or no-deal will be in March 2019, so if you are planning to travel with your pet to Europe after this date, you need to start considering the above information right now. You may decide that the most complicated outcome is likely and will need to have a blood test for your pet in December this year, or you may decide that the first option will happen, and you need do nothing. Unfortunately, there is no definitive answer and there won’t be one until the March deal. Therefore, let’s hope for the easiest solution, but prepare yourself for the most complicated one! Sleeping Bags - Sports Kits - Curtains - Floor Rugs ANYTHING YOU WANT WASHING BIGWASH WILL WASH IT! Could you use some help with your cleaning, ironing or both? Are You: Reliable, Honest and Trustworthy? Able To Clean To A High Standard? £9.00 p.h. ● Local jobs We Are a Long Established Local Company Car essential ● Part time hours to suit! The Clock Shop Your next event catered for! Official Government Fuel Consumption Figures (Range) Urban Cycle, Extra Urban, Combined (litres per 100km/mpg) & CO2 emissions (g/km); Highest: Dispatch Combi HDi 160 6-speed automatic L1H1: Urban 9.0/31.4, Extra Urban 6.8/41.5, Combined 7.6/37.2, CO2 199g. Lowest: Citroën C4 Cactus Blue HDi 100 manual Touch EGS: Urban 3.5/80.7, Extra Urban 2.9/97.4, Combined 3.1/91.1, CO2: 82g. Fuel consumption figures quoted are achieved under official EU test conditions. Intended as a guide for comparative purposes only. Figures may not be reflected in actual on-the-road driving conditions. *Available when purchased on Elect 3 finance plan. Final payments apply on selected models, one payment of £3,488 for C1, £5,083 for C3, £7,752 C3 AIRCROSS. Price & offer applies to retail sales of qualifying models ordered & delivered 01/11 - 31/12/2018 & include VAT, delivery to dealer & number plates, Government Registration Fee & 12 months’ graduated vehicle excise duty. **No final payment on C4 Cactus Hire Purchase agreement. Finance subject to status. A guarantee may be required. Over 18s only. Finance provided by and written quotations available on request from PSA Finance UK Limited (company registration number 01024322) t/a Citroën Financial Services, Quadrant House, Princess Way, Redhill, Surrey, RH1 1QA, UK. Citroën Financial Services is authorised and regulated by the Financial Conduct Authority. Robinsons Motor Group is acting as a credit broker and is not a lender. To finance your purchase/lease we may introduce you to a limited number of lenders. Offers & prices correct at time of going to press from participating Dealers. Terms & conditions apply. Please ask us for details. Subject to stock availability.